by Ryn McCoy on March 22, 2018 » Add the first comment. The Camas High School Choir performed in collaboration with AU in 2016. This April, they will perform with Bright Moments. It’s the youth of the world teaching you a lesson that will stick with you forever. The program culminates in three performances. 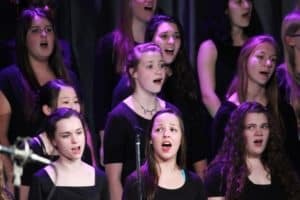 The choir will perform at Camas High School for friends, family and faculty before their public concert in Portland, which will take place on April 13 at PICA. They will then go on tour to Seattle to perform at The Vera Project on May 24. This show is proof that youth voices should be taken seriously. And the students involved in this several-months-long project come away with more than just performances. Working closely with Chessin and Pratt, Young Audiences facilitates a Business of Music program that connects students with professionals in the music industry, such as film director Alicia J. Rose, recording engineer Jason Powers, and artist manager Gina Altamura among others. This year’s program focuses on familiarizing students with the creation and distribution of recorded music in the internet age. 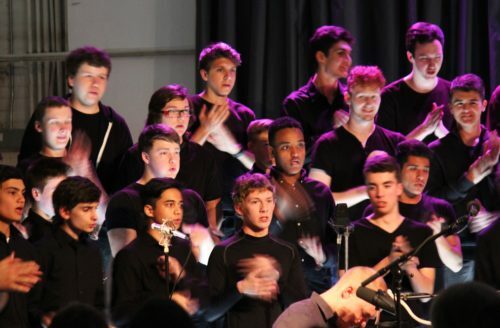 The Camas High School Choir program has earned praise around the Northwest for its engaging performances of unique, diverse repertoire, including collaborations with local musicians Sama Dams, Alan Singley, Point Juncture, WA, AU/Luke Wyland and more. In recognition of his dedication, innovation and excellence as teacher, Chessin was named Regional Teacher of the Year and Camas School District Teacher of the Year in 2017. Bright Moments, the solo project of Kelly Pratt, has composed new music for the Camas High School Choir to perform. Bright Moments continues the choir’s trend of cutting-edge collaborations. From 2006–2012 Pratt was a full-time member of indie-pop outfit Beirut, contributing arrangements, brass/woodwinds, and vocals. He has performed and recorded with hundreds of artists including Arcade Fire, LCD Soundsystem, Coldplay, and Passion Pit. In 2012 and 2013, he collaborated with David Byrne and St. Vincent, providing arrangements for their album “Love this Giant,” as well as serving as arranger and musical director for their world tour. He is currently touring with Father John Misty as an arranger, conductor and multi-instrumentalist. KBOO-FM and XRAY.fm are media sponsors of this concert.